The project required the dismantling of two column-guided below ground gas holders, identified as No.1 and No.5. Holder No.1 consisted of three lifts, eighteen column legs and associated inter-connecting steelwork plus above ground pipework valve pits and an associated small generator house. Holder No.5 consisted of two lifts and eighteen cast-iron legs with inter-connecting steelwork which encroached into National Grid’s live operational area and therefore required an National Grid ‘Permit to Work’ to enable works to proceed. A small anti-freeze building also required demolishing within the area. The gas holders were approximately a quarter of a mile apart; on opposite sides of Towcester Road. The team therefore established the main site at Holder No.1 and a ‘satellite’ at Holder No.5 where limited space was available. An incident at Holder No.1, caused by a third party working alongside the site, caused weeks of delays as the team were unable to establish welfare and laydown areas. The dismantling of Holder No.1 required the lifting operations to be undertaken outside the site boundary wall on adjacent Tanner Street. This involved liaising with the local council to obtain road closures for the duration of our works. The team implemented the required protection works on Tanner Street and installed the crane into a permanent ‘in-situ’ position for the duration of our works. Working on a forty nine metre jib and at a radius of fifty three metres, we were able to dismantle the holder at an accelerated pace bringing the contract back on programme; vital to our client’s land sale. Working alongside our specialist de-watering team, Robinson & Birdsell Ltd’s operatives removed the holder cups and washed them off to remove any residual sludge. The specialist dewatering team completed the final desludging of the holder before Robinson & Birdsell Ltd’s operatives removed the inlet and outlet pipes. These voids were then backfilled and sealed with concrete. The project was completed on programme with no incidents or lost-time accidents and to the total satisfaction of our client along with 99% of site materials being recycled. Scope of Works: Dismantling and demolition of two column-guided below ground gas holders, associated pipework and valve pits plus small generator house and anti-freeze buildings. This project called for the dismantling of a four lift in-ground gas holder, along with associated pipework adjacent to a live Pressure Reduction Station (PRS) and in-ground valve pit. Along with the demolition of the Riverside House office block, the office block known as the Chocolate Box and a warehouse building; all contained within the site boundary fence line. During the building demolition National Grid Property Holdings agreed with Centrica Gas that all their employees could have access to a car park located twenty metres away from both Riverside House and the Chocolate Box. During the demolition phase of work Robinson & Birdsell Ltd erected wooden hoarding around their work area to at least three metres in height to protect Centrica’s car park. Utilising a water cannon to supply dust suppression throughout the demolition Robinson & Birdsell Ltd were able to keep the car park open for the duration of these works mitigating any dust incursion. All arisings from the demolition were recycled wherever possible, this included; scrap metal, timber, plastic, and the concrete which was crushed onsite down to 6F2 standard. 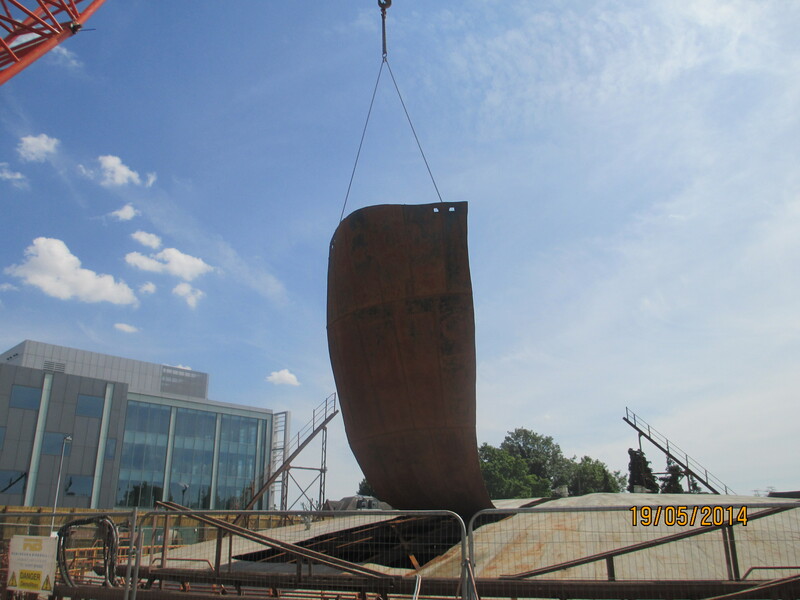 This crushed concrete was used as backfill following the dismantling of the gasholder. The de-watering of the gas holder was delayed by over two weeks due to localised flooding of the River Thames. Despite this problem, the project team was still able to complete the work to programme by accelerating other phases. 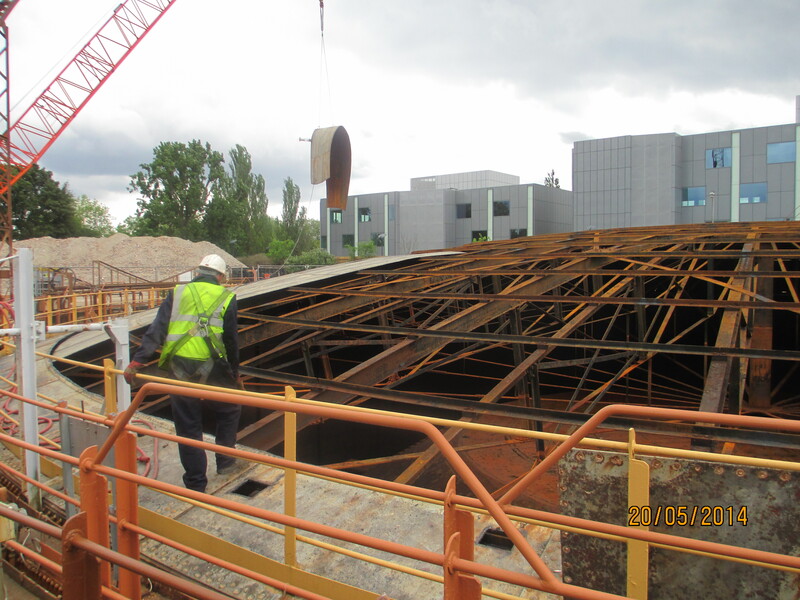 The crawler crane with a eighteen metre mobile elevation work platform (MEWP) was used to gain access onto the dumpling area to allow topman burners to hot-cut free the umbrella steel roof structure. This was then attached, in sections, to the crane using two sets of brother chains and lifted into the laydown area for size reducing by a 360° excavator with shear attachment. The inner lifts were cut into appropriate sections by a topman burner working from a man-riding basket. This project was completed on schedule with no incidents or lost time accidents and to the total satisfaction of our client along with 99% of site materials being recycled. Notwithstanding this, the work was completed on schedule and without incident. Finally, without having to deal with the unprecedented weather conditions prevalent at the time, and the resulting flooding, the team would have clearly brought this project in ahead of programme. Project Scope: Dismantling and demolition of four lift in-ground gas holders and associated pipework and valve pits, plus the demolition of Riverside House, Chocolate Box and warehouse buildings.